Profilometer is a device which is used for measuring the surface profile. In addition, it is used for quantifying the roughness of the surface. Vertical resolution of the surface, which is the resolution between the high point and low point is usually measured at the nanometer level by providing lateral resolutions through a profilometer. The profilometer is used for both static as well as dynamic topography. Currently, profilometer manufacturers are more focused on new product development and innovative profilometer technology, as consumers are preferring more advance products which provide more in-depth statistics and analysis of the surface’s profile in order to quantify the roughness. Higher usage of 3D non-contact profilometers is expected to drive the profilometer market during the forecast period. 3D profilometers have the capability to run multiple techniques on the same tester. Additionally, 3D profilometers differ from interferometry and touch probes and has the advanced ability to measure the high surface angles without any manipulation of the software; this is expected to drive the profilometer market over the forecast period. Rapid demand from electronic, semiconductor, and automotive fields are expected to fuel the global profilometer equipment market. 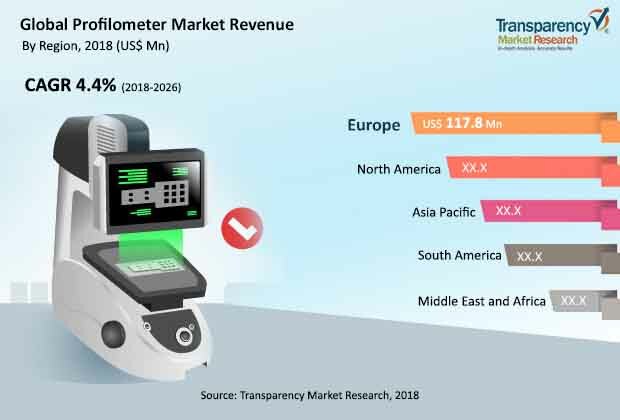 Moreover, growing automotive, electronic, and semiconductor industry in developing and emerging regions such as Asia Pacific, followed by Europe, is expected to drive the profilometer market across the regions over the forecast period. High investment cost of machinery for setting up production units is expected to have a negative impact on the profilometer market during the forecast period. Cost of electricity, support electronic components, and maintenance of machines among others are the various costs entailed in the installation of profilometer technology. Thus, high investment cost is anticipated to be one of the key challenges for the market. Furthermore, inaccuracy in resolutions when the surface features are same as size of the stylus is expected to hamper the growth of the market. Based on type, the profilometer market is classified into contact profilometer and non-contact profilometer. Non-contact profilometer is further sub segmented into time-resolved profilometer and fiber-based optical profilometer. Moreover, the non-contact profilometer segment is expected to create huge opportunity for the profilometer market during the forecast period. The contact profilometer segment is expected to maintain its market share over the forecast period. Contact profilometers are considered to be the most reliable measurements owing to the fact that they can directly touch the sample. Additionally, it provides clear wave profile and is also capable of measuring long distance measurements. All these factors are expected to drive the profilometer market during the forecast period. Under the method segment, optical methods are expected to maintain their market share during the forecast period. Optical methods dominated the market due to their rising adoption in the semiconductor and automotive sector. In addition, optical profilometers provide good resolution, high speed, and more accuracy compared to contact and pseudo-contact profilometers. However, contact and pseudo contact methods dominated the market due to their low cost and wider acceptance. This is mainly because most of the world’s surface finish standards are written for the contact profilometer and is widely adopted in several industries. Under the dimension segment, profilometers are segmented into 2D and 3D. 3D profilometers are widely adopted because they can cover a large image area and select the specific part that needs to be addressed. 3D technology is seeing more advancement and benefits as it can measure the texture and the roughness over large 2D areas without contacting the surface. Under the application segment, the automotive industry is expected to accelerate the profilometer market during the forecast period. Additionally, growth in semiconductor and electronic sectors has also resulted in the rise in usage of such instruments in these industries. The market in Asia Pacific is expected to have high growth prospects. India, China, and Japan are expected to drive the region during the forecast period. The region is witnessing strong research and development of profilometers due to rapid industrialization. Europe dominated the global profilometer market due to rising innovation and strong research and development in semiconductor industries. Rapid growth in technology and operational excellence in Europe has resulted in the adoption of profilometers in Europe. As compared to Europe, Middle East & Africa and South America are projected to show a lower growth rate during the forecast period 2018 – 2026. The companies profiled in the global profilometer market report include KLA-Tencor Corporation, Mahr Federal Inc., Zygo Corporation, Solarius Development Inc., Mitutoyo America Corporation, Schaefer Technology GmbH, Tokyo Seimitsu Co., Ltd, L. S. Starrett Company, Sensofar Group, Bruker Corporation, Jenoptik AG, Teräspyörä-Steelwheel Oy, Alicona Imaging GmbH, and AMETEK.Inc.